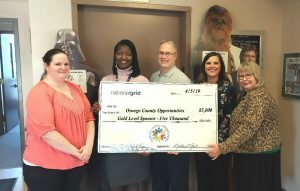 FULTON, NY – Oswego County Opportunities announces that National Grid has signed on as a Gold Level Sponsor for OCO’s “May the Fourth Be With You” Bowl-A-Fun. Members of the planning committee for Oswego County Opportunities’ May the Fourth Be With You Bowl-A-Fun welcome National Grid as one of the events Gold Level sponsors. From left are committee member Candra McFarland-Gawarecki, National Grid Community Relations Manager Gwen Sanders, National Grid Customer and Community Jurisdictional Manager Walter Dengos; OCO Development Coordinator Bridget Dolbear, and committee member Betsy Copps. Proceeds will support OCO’s efforts to do “whatever it takes” to help families succeed. National Grid joins G & C Foods as gold level sponsors and The Shineman Foundation, Glider Oil, and One Group as Silver Level sponsors for OCO’s “May the Fourth Be With You” Bowl-A-Fun. OCO’s “May the Fourth Be With You” Bowl-A-Fun will held May 4 at Lakeview Lanes, 723 W. Broadway. 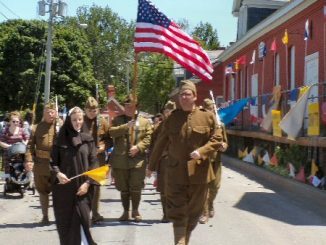 For information on team registration, pledges and donations/sponsorships, visit www.oco.org or contact the OCO main office at 315-598-4717.